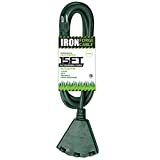 LIFETIME REPLACEMENT WARRANTY - Iron Forge Cables stands behind all of its extension cords 100%. If anything ever goes wrong with this, we will replace it with a new item. 3 OUTLETS IN 1 for simultaneous multiple use. WATER RESISTANT: Flexible vinyl covering protects cords against moisture, abrasion and sunlight. ALL PURPOSE EXTENSION CORD for Indoor and Outdoor use. Great for gardening, landscaping, or powering any household appliance. 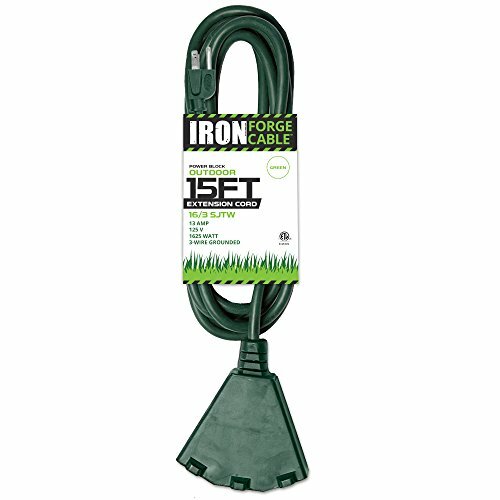 GREEN CABLE blends into your exterior landscape and is perfect for outdoor Christmas lights and decorations. SLIP RESISTANT DESIGN.